Reginald Rose's landmark American drama was a critically acclaimed teleplay, and went on to become a cinematic masterpiece in 1957 starring Henry Fonda, for which Rose wrote the adaptation. 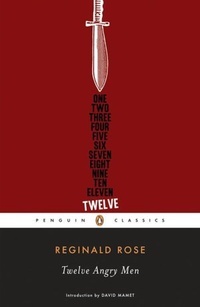 A blistering character study and an examination of the American melting pot and the judicial system that keeps it in check, Twelve Angry Men holds at its core a deeply patriotic belief in the U.S. legal system. The story's focal point, known only as Juror Eight, is at first the sole holdout in an 11-1 guilty vote. Eight sets his sights not on proving the other jurors wrong but rather on getting them to look at the situation in a clear-eyed way not affected by their personal biases. Rose deliberately and carefully peels away the layers of artifice from the men and allows a fuller picture of America, at its best and worst, to form.